Oven roasted chicken is on repeat rotation on our weekly menu. I often start the week out with a pair of chickens roasted in the oven and use the leftovers for other dinners and lunches. Having leftover roasted chicken is the key to all these throw together meals: chicken enchiladas, sun dried tomato chicken pasta and my lunch staple, Chicken salad with grapes and cashews. To keep the roasted chicken from getting boring, I vary the pan sauces I make with the pan drippings. This week, thanks to the addition of dried figs, my roasted chicken sauce was more exotic than simply stretching out the delicious roasted chicken drippings with water and a few shallots. 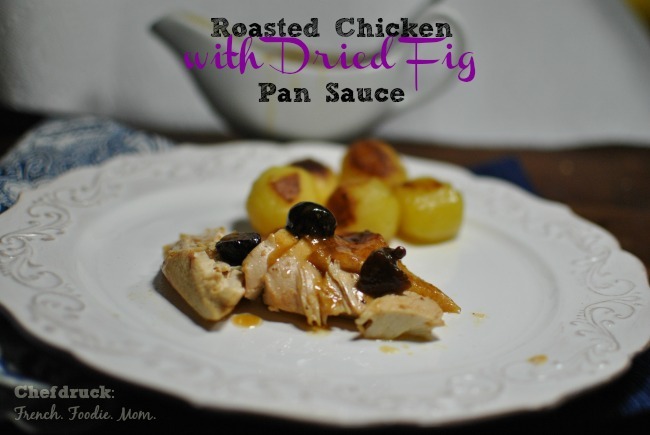 Once the chicken was cut up and ready to serve, I placed the roasting pan back on the burner and added 1/2 cup of chopped up dried figs, a quarter cup of mustard, and a half a cup of water. I had the burner on medium high heat and everything began bubbling and smelling great. Holding the pan with a thick kitchen towel, I made sure all the little pan drippings were scraped off the bottom and added to the liquids. Three minutes later, the sauce had thickened slightly and was ready to be strained and served next to the chicken. Roasted chicken drippings are already delicious, so just stretching them out with some water is enough to make a great pan sauce. But experimenting with unusual ingredients like dried figs or cherries can make this every week dish taste incredibly exciting. If you want some roasted chicken recipes before you think about what sauces to end with, please check out my soy butter roasted chicken recipe, or this basic roasted chicken recipe. Remove the chicken from the pan. Cut and set aside. Set the chicken roasting pan on top of one (or if you can two) burners on medium high heat. 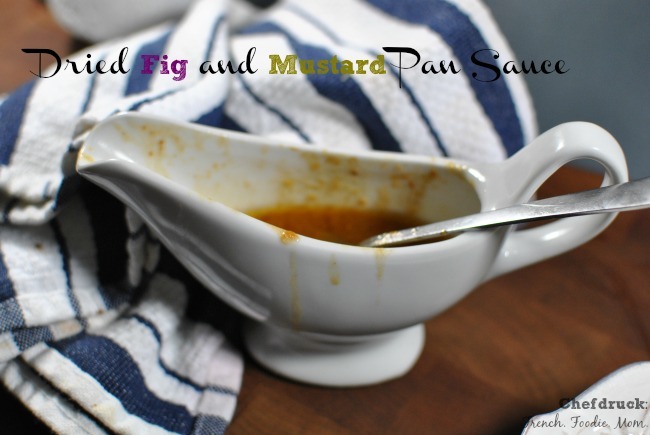 When the pan drippings begin to crackle, add the figs, mustard and water. Scrape like crazy with a wooden spoon and cook for 2-3 minutes, until the sauce begins to thicken slightly. Pour into a strainer over a serving container. Fish the figs out of the sieve and add to the sauce. Serve immediately.